Where are the old municipal furniture elements ? Abraded, damaged or broked, they remain an excellent material. By repairing and transforming them, the ETC Collective create new objects, with revisited functions and uses. These items can then be used as tools for fitting out public spaces. During the 2015 Biennal, a Ephemeral Bureau for Urban Activation (B.E.A.U in french) was settled for a time of experimentation by Carton Plein in collaboration with ETC Collective and EPASE. Several initiatives, experimentations and prototypes as « Les vieux beaux » took place in the new Grand Gonner Street in Jacquard disctrict. This project seeks to grow vitality of the territory, reinvestment of vacant ground floor and neglected streets. The aim is to inject and boost a real collective action. The Cité du design and the City of Saint-Etienne launched a call for urban furniture in public spaces tested during the Biennal International Design Saint Etienne 2015. Carton Plein, a interdisciplinary Collective, who works essentially in public spaces. Carton Plein integrates the ETC Collective in his own projet and programmation for the Biennal. The EPASE (Local Planning and Development Authority) provides financial support. The City of Saint-Etienne provides equipment, authorisations, staff et technical support. EPASE benefits from an alternative offer in his renovation programme of the neighbourhood. The City of Saint-Etienne can promote furniture inventory and inspire other possibles uses for this ressource. The ETC Collective is an association who essentially works on urban spaces experimentation. Their projects focus on participative, artistic and social approach, that question public environment and new behaviors it gives rise. 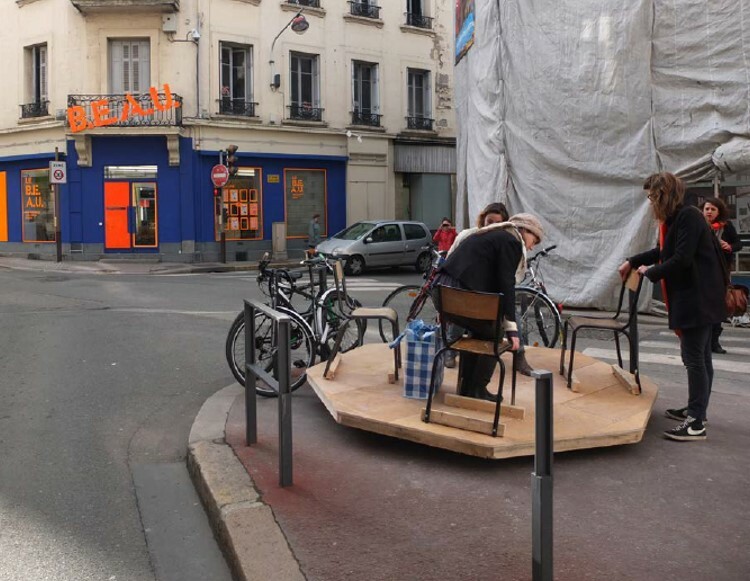 For « Les Vieux beaux », they wanted to divert, repappropriate and give new uses to old municipal furniture of Saint-Etienne.